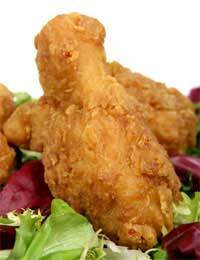 Home > Types of Fast Food > How Healthy Are Fried Chicken Takeaways? What’s In A Fried Chicken Meal? Nutritionally, the most healthy part of the meal is the chicken itself, although the scare stories about the conditions that some large fried chicken chains keep their birds in does lead you to wonder if they are really that healthy after all. The chicken meat is a good source of high quality protein, iron and also B vitamins, including niacin, which are essential for healthy skin and nerves. The dark meat is also a good source of zinc. If you take the coating off of the chicken, you save in salt, fat and calories, but let’s face it, the coating is the tastiest part!The fries that you get with the average fried chicken take away are deep fried and often made from not very appetising reconstituted potato. The thinner the fries, the more fat they absorb so the percentage of fat you’ll be eating with your meal starts to rise even more. Some of the side orders on a fried chicken fast food menu are surprisingly nutritious, so if you’re going to have the chicken, add some of the healthier options rather than simply sticking with fries. For example a portion of baked beans is usually on offer, and baked beans offer a healthy shot of protein along with vitamins including the antioxidant lycopene from the tomato sauce, and some fibre. Another great choice is a corn cob, or cobette. Sweet corn is another great source of fibre, plus vitamins and minerals, and will probably take you longer to eat than a bag of soggy, salty fries. Go easy on the coleslaw, although it does contain some vegetables, you’ll also get quite a hefty dollop of mayonnaise, which may not be the best quality and of course is also loaded with fat. Some chains are starting to advertise that they no longer fry their fast food in oil that contains trans-fats, the unhealthiest form of fat, but even though this is slightly better health wise, it doesn’t alter the fact that a fried chicken meal will be very high in fat anyway. Some fast food chains offer options such as a chicken salad or burger, which they advertise as being a more healthy option. Be aware of what else is in the burger if you’re going to go for that option, and make sure that you don’t load the sandwich up with extra fillings and salty dressings that add nothing but fat and calories to your meal. The salads are another option that can work if you know what to leave out! The basic salad can be a good meal choice, but once you add the dressings you can double the fat content of what should on the face of it be a healthy meal in one fell swoop! Eaten occasionally, a fried chicken take away is not going to do you any harm. Just don’t be fooled into thinking it’s automatically better for you than any other take away!